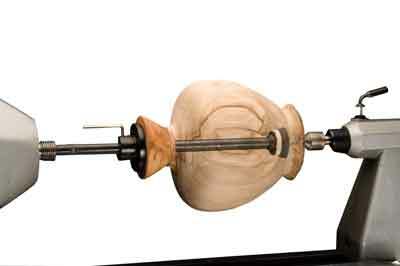 I could not wait to use the Woodchucker Mandrel as my work primarily involves making hollow forms. Generally I use a roughed down friction drive held in my chuck and finish the bases of my forms with the running tailcentre, which is used to apply pressure to the base. I was interested to review this mandrel and see what benefits it could give me. On occasions, on thin walled forms, I have found my method wanting as the pressure from the tailstock has caused cracking on the front face of the form. The mandrel is well made and solid and comes with a central bar onto which fits a 75mm (3in) faceplate - a tapered turned friction drive made from waste wood to fit the opening of the form is then screwed to this. 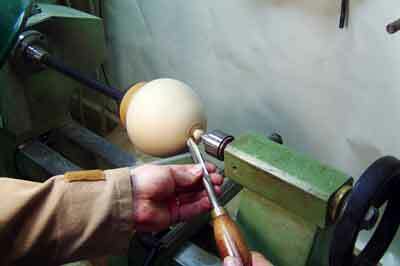 The end of the mandrel accepts any sanding pad with a 6mm (1/4in) diameter shank. The faceplate is adjustable to any location on the mandrel, enabling the base of forms up to 405mm (16in) in depth to be finished. The faceplate provides support at the top of the form and the sanding pad adds extra support by sandwiching the base between the pad and the tailcentre. I found that this added support to turn the base of my form down to a few millimetres without any flexing or chattering being encountered. Using this piece of equipment gave me total confidence that I would not break the neck of the form by applying too much pressure. I also knew I could take the base as thin as I wanted without the tailstock forcing through the base. The mandrel can also be used to turn pre-drilled projects such as peppermills and kaleidoscopes, by adding another faceplate to the opposite end, making this a versatile and cost effective piece of tooling. I am impressed with this piece of tooling and will continue using it for my day-to-day turning needs.